My Administration is working hard to ensure that the State of Hawai’i will be at the forefront of high-speed technology. Please take a minute to view this special message about the Hawai’i Broadband Initiative and how your state government is examining ways to enhance our statewide broadband network by closing gaps in service, ultimately improving connectivity throughout the Aloha State. Aloha. This is Governor Neil Abercrombie. For a state as isolated as our own, high-speed Internet can be transformative. It connects families, businesses and institutions – between the islands and with the rest of the world. It spurs economic development, fosters innovation, and gives current and future generations a competitive edge. That’s why my Administration has launched the Hawaii Broadband Initiative, to provide universal access to affordable, ultra high-speed Internet by 2018. Leveraging federal funds, our goal is to establish a statewide connection of one gigabit per second. That’s two hundred times faster than today’s typical household connection. But we need your help. Visit HawaiiSpeedTest dot net to measure the current network in your area. Take the test often, at different times of day, and from multiple computers and mobile devices. The Office of Hawai’i County Mayor Billy Kenoi is pleased to announce the Student Malama Award, the first Hawai‘i Island student sustainability award to highlight and celebrate youth led stewardship and sustainability initiatives on the Big Island . Outstanding student leaders in this field will be awarded $500 scholarships. Individual students and student groups from public, charter and private schools, as well as for-profit or non-profit youth organizations are eligible to apply. Projects may include, but are not limited to topics such as renewable energy and energy efficiency, agriculture such as school gardens and local foods; resource management such as zero waste, community-based volunteerism, social and community service, and environmental projects such as conservation and preservation of the ocean, land and forest. Scholarships will be awarded to winners in K-5, 6-8 and 9-12 grade categories. An awards ceremony luncheon with Mayor Billy Kenoi will be scheduled for the end of the school year. Nomination applications may be found on the Office of the Mayor’s website at www.hawaiicounty.gov/office-of-the-mayor/categories/SMA. The nomination deadline is April 15, 2012. For more information contact Barbara Kossow at 323-4448 or Lisa Robertson at 961-8211. The Ka‘ū Coffee Festival kicks off 5-9 p.m. Saturday May 5th with Ka‘ū Farmers’ Table: A Feast for the Senses hosted by Kalaekilohana Bed and Breakfast. The event features an intimate evening of music with world-renowned Hawaiian entertainer Robert Cazimero and the culinary magic of Executive Chef Morgan Starr of Mi’s Italian Bistro. The locally sourced fare includes a paired five-course gourmet meal and a Ka‘ū coffee dessert bar. Tickets are $100 in advance. The event is being sponsored by Mi’s Wine and Cheese Shop, Hana Hou Restaurant and Kalaekilohana. For information and tickets, contact Kalaekilohana at 808-939-8052. Second, the Triple C Recipe Contest, hosted by Ka‘ū Coffee Mill on Wood Valley Road above Pāhala, is 2 p.m. Sunday, May 6. Triple C stands for cookies, candies and crackers made with Ka‘ū coffee. Judges include local chef Brad Hirata. Listen to Hawaiian music with Keoki and Moses Kahumoku, tour the new Ka‘ū Coffee Mill, cheer on the recipe contest entrants and sample the delectable entries as they vie to become a signature Ka‘ū Coffee Mill product. Grand prize is $500; other prizes will be awarded in each category. The contest is co-sponsored by Pahala Plantation Cottages, OK Farms and Edmund C. Olson Trust. For contest rules, visit kaucoffeemill.com. or call 808-928-9811. Third, on Saturday May 12, get set for the 4th Annual Ka‘ū Coffee Festival Ho‘olaule‘a featuring the Ka‘ū Coffee Experience in the heritage town of Pāhala. Attendees can sample Ka‘ū coffees prepared in a wide variety of brewing methods while chatting with 2011 U.S. Barista Champion Pete Licata. Festival highlights include day-long live entertainment featuring music by Cyril Pahinui, Keoki and Moses Kahumoku and a host of others, plus hula, local food and crafts, farm and mill tours and lots of internationally renowned Ka‘ū coffee. Festival entry is free. Entry to the Ka‘ū Coffee Experience and tours are $10. Visit kaucoffeefest.com for frequent updates and a schedule of events. Finally, on Sunday, May 13, the Ka‘ū Coffee College returns with its reverse trade mission and educational series. Notable guest speakers include Jeff Taylor, co-founder of PT’s Coffee Roasting Company in Ann Arbor, Michigan and Anthony Carroll, manager of Coffee Quality for Starbucks. Dr. Robert Hollingsworth, research entomologist with the USDA-Agricultural Research Service, will share strategies for optimizing the cost effectiveness of controlling coffee berry borer. Ka‘ū Coffee Festival – Ka‘ū burst onto the specialty coffee scene by winning numerous awards over several years. These awards highlight the unique combination of people and place that help make Ka‘ū coffee a favorite across the globe. The Ka‘ū Coffee Festival’s mission is to raise awareness of Ka‘ū and its growers as a world-class coffee growing origin. Visit kaucoffeefest.com or call 808-929-9550. Vendor and sponsorship opportunities are available. The Festival is supported in part by the County of Hawai‘i Department of Research and Development and Hawai‘i Tourism Authority. The Washington Post reported today that Lahe’ena’e Gay from Pahoa was one of the residents found in a Venezuelan pasture back in 1999 and the Colombian rebel leader who killed her, William Alberto Asprilla, was finally captured in Venezuela. A member of Colombia’s largest rebel group has been captured in neighboring Venezuela and is wanted for his role in the kidnapping and killing of three Americans in 1999, Colombian police said Thursday. William Alberto Asprilla, also known as “Marquetaliano,” was detained Wednesday while on the road between Caracas and the nearby port of La Guaira, said Gen. Carlos Mena, director of Colombia’s judicial police. Full Story Here: Colombia says leftist rebel captured in Venezuela, wanted in slayings of 3 US citizens. I’d just personally like to say thank you and mahalo to a gentlemen at MadCow Studios for making a very generous donation to my website. Every now and then I will get a donation to my site and normally it’s from someone I know or a company that I’ve done some business with in one fashion or another. I really enjoy reading your site and keeping up on the news in the islands. Well for those that know… know that I love to blog and I’m glad that folks even as far away as the mainland have been appreciating my site. Mahalo to all my sponsors, PR folks, contributors, folks who make donations… and most importantly you… the folks reading my site. Without an audience… I wouldn’t do what I do. Lehua Veincent has been named new Po’o Kumu (Principal) for Kamehameha School (KS) Hawai‘i’s high school campus. “Kumu Lehua is an experienced, responsive, innovative and effective educator with more than twenty-five years of experience as a teacher and school administrator in the State of Hawai‘i Department of Education,” said Dr. Holoua Stender, future Po‘o Kula (Head of School) for KS-Hawai‘i after the departure of current Headmaster, Dr. Stan Fortuna this July. 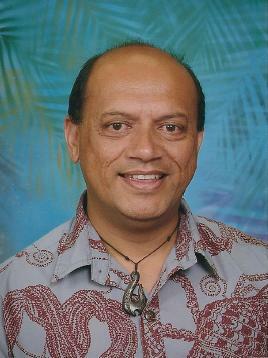 Veincent is currently the principal of Keaukaha Elementary School and is deeply rooted in the Keaukaha community. In addition to tutoring students and actively engaging the community with the school, Veincent also began the successful “Got Pono” campaign at Keaukaha which has built student and community pride and ownership in the school and its outcomes. “I have dedicated my life to educating Hawai‘i’s children and my passion for educating Native Hawaiian children is at my core,” Veincent said. Veincent holds a master’s degree in K-12 Education in Curriculum and Instruction and a master’s in K-12 Education administration, both from the University of Hawai‘i at Hilo. Currently, he is pursuing a doctorate in Curriculum Studies at the University of Hawai‘i at Manoa. Prior to Keaukaha Elementary School, Veincent was the principal and founder of the Ke Ana La‘ahana Public Charter School, a 7-12 grade Hawaiian cultural-based school located in Keaukaha where he still serves as Board Chair. With over 25 years in public education, Veincent has also served as Vice Principal of Hilo High and Intermediate Schools and as a state resource teacher in Hawaiian Language and Culture. Veincent has also taught Kindergarten through 12th grade. Active on several community boards, Veincent is also an instructor at the University of Hawai‘i at Hilo’s Education Department. Veincent will join Kamehameha Hawai‘i on July 1, 2012. Waimea Artists’ Guild (WAG) offers a series of workshops for all ages, ‘Ohana in the Arts, launching this month in their new Waimea studio space. All classes take place on Fridays: 5-6:30 p.m. for children 6-12, and 7-9 p.m. for age 13 through adults. Currently, Geoffrey Mundon is teaching a 4-part Printmaking Workshop on Fridays March 23-April 6. Using natural forms and cultural symbols with varying print techniques, Mundon shares his skills and inspires students from first-timers to advanced artists, in the WAG studio. The cost is $20 per class for the Printmaking Workshop, and students may attend one or all class sessions in the series. Geoffrey Mundon, demonstrates printmaking techniques to students Iwalani Mehau, Sara Mundon, Kaimana Landers, and Armand Baril. Photo by Tom Mehau, WAG. Geoffrey Mundon completed the Hawaiian arts program at HOEA (Hawaiian ‘Ohana for Education in the Arts) in 2011 and currently focuses mostly on bone jewelry and printmaking. Typically, he works “on the fly” with anything available to capture those fleeting, otherworldy moments that happen daily. Compelled to build a kind of vocabulary for that and for the personal connections he makes, he says it makes him feel a little more rooted in this world and a little more cosmopolitan in other realms. He’s thrilled when it turns into art. The next ‘Ohana in the Arts Workshop takes place April 20-May 18, when Marshall Leonard Kary, Jr., teaches a four-week course in Visual Fundamentals at the WAG studio. A professional artist and photographer, Kary is also an instructor at the UH West Hawaii Campus. He will explore with students the dynamics of drawing, including line form, texture and shape, using a variety of tools and papers. In June, Toma Barboza presents a five-week Woodworking course, on five Fridays, beginning June 1. Barboza guides students through their first project–carving a fishhook—while learning techniques and tools. He then helps carvers select and create other cultural implements for additional projects, based on their own interests. Also in June & July, WAG presents its Summer Session classes, an exciting and inspiring series, with a wide variety of media, including Oil Painting with Patrick Ching, Relief Printmaking with Harinani Orme, and Cultural Jewelry with Stacy Gordine (beginners and advanced). Summer Session courses are multi-day workshops at the WAG Workspace. Complete course list and descriptions are available at www.WaimeaArtistsGuild.com.